I was supervising a teacher who was enrolled in our program at the University of Massachusetts Amherst that focused on developing student self-knowledge, ego strength, trust and community in classrooms. We had created a manual with over 50 classroom lessons. She was teaching at a high school in an economically depressed district in northern Appalachia. She called me in a state of frustration. "I've used dozens of the exercises you guys developed, and they're not the least bit interested. There's no sense of community, and the trust level is non-existent. I need help." So I visited the class. It was in the unfinished basement of an old school -- cement floors and walls, ceiling-to-floor poles throughout the room. It was more like an interrogation chamber than a classroom. Our "humanistic exercises" were a bad joke in this setting. I suggested that she ditch the exercises and work with the class to totally change the physical environment. I knew she'd have support from a principal committed to transforming this school. The plan we developed was to piece together carpet remnants from local merchants, seek paint donations from paint shops, and come up with wall decorations, either student-designed or donated. They spent six weeks doing little else. When I came back and walked to my seat across the warm, brightly-carpeted floor, I experienced a wonderland of painted walls and poles, and a gallery of photographs, paintings and textured wall hangings The teacher told me that the process of doing this had created trust, community and ego strength, unlike our misplaced exercises. She was finding the students far more motivated. They were happy to be in this place they'd created. There are at least two lessons from this story. The physical structure of a classroom is a critical variable in affecting student morale and learning. Students' involvement in the process of creating their environment can empower them, develop community and increase motivation. Here's a related story. One of my mentors at U Mass did his doctorate in classroom environments. He then took a temporary job as head custodian of a school to get a better firsthand sense of the physical environments of schools. One of his primary conclusions was that classrooms were usually arranged to meet the needs of the custodial staff more than the needs of students. This was reinforced for me both as a high school teacher and university professor. I always arranged the chairs in a semicircle and always returned the next day to find the chairs placed in rows. It's conventional wisdom that different types of instruction require different seating arrangements. It's also a no-brainer that classrooms should be inviting, environments that make students feel good to be there. Unfortunately, over the years I've visited classroom after classroom where conventional wisdom appeared to be disregarded. So here's a short course. If you have seats in rows, students at the front can't see any of the students in the class. Those in the back mostly just see the heads of their fellow classmates. If that's your arrangement for establishing order and your primary approach to teaching is not interactive, that will work. Given my goals as a teacher, I wouldn't even consider a job at a school that had desks nailed to the floor in rows. If you have a room filled with tables, that will be excellent for group work, but you'll need to move the tables to the back and sides when you want to bring students together for other purposes. I had small tables in my university classroom, because that's what I was given. I arranged the tables in a semicircle, with 3-4 students at each, some with their backs to the table for most activities. A semicircle encourages interaction and enables all students to see each other. This is important if you place a high value on relationships between students, building community and creating an open environment. When I did a workshop that included significant student sharing, building community and increasing trust, I found a space with chairs, preferably ones with writing surfaces for note taking. If that wasn't possible, we moved the tables and used the center of the room for chairs. Moveable chairs, with or without writing surfaces, provide maximum flexibility for any kind of teaching. Classrooms with minimal windows and minimal outside light increase student depression. At the other extreme, windows without adequate room darkeners make visual media difficult to use. Students spend much of their day in classrooms that almost never feel warm and homelike. Rooms that do will improve student morale and make students happier to be there. This requires having more on the walls than butcher paper! It provides the opportunity for students to help create an inviting environment that supports positive interaction. And it empowers students in the process. I'm also aware that many high school teachers don't have a single classroom. So the best they can do is to rearrange seating each time they enter the next classroom. Having two or three student volunteers to do this helps. It's also possible to get other teachers who use the room to cooperate in the process of making the room more inviting. One of the best is The Third Teacher, a collaborative work from Abrams Books. 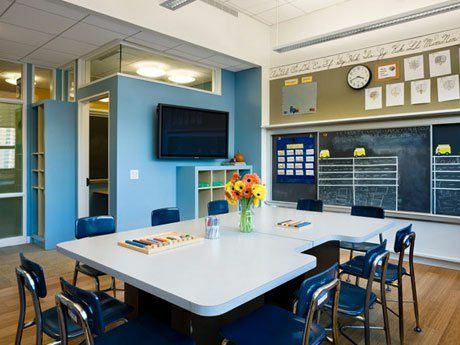 The Classroom Design page of the Behavior Advisor site is a rich resource for guiding options on arranging classrooms. Classroom Desk Arrangement, while a bit less easy to follow, is also filled with rich ideas. For more general direction from the University of North Carolina School of Education, Kristi Smith's 12 rules are a quick, useful guide to things you need to think about. Scott Doorley and Scott Witthoft's Make Space: How to Set the Stage for Creative Collaboration is more generally focused, but educators can find many creative ideas for physical environments that maximize participant cooperation and creativity. Classroom physical environment affects morale and student learning. The environment should match your objectives, both in terms of human interaction and your instructional approach. The arrangement of seating is one major variable. Including students in creating the physical environment can enhance that environment, increase the feeling of classroom community, and give students a sense of empowerment. I'll leave you with one more thought. If you're a teacher, you spend a good part of your life in places that should feel more like a warm home than a cold, impersonal office building or warehouse. So consider increasing your own sense of well-being and motivation as much as increasing these qualities for your students.